Emily Schmidt 5’11 Senior at Watertown Luther Prep has been elected into the Wisconsin Lakers Hall Of Fame. Emily was a member of the Wisconsin Lakers for 3 seasons. This past season Em was on Lakers White. 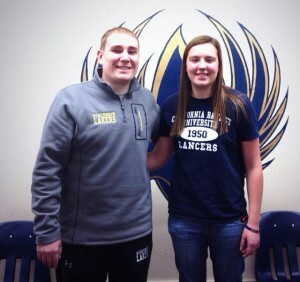 In the Fall she signed with NCAA D2 California Baptist on a basketball scholarship. Emily is a tremendous kid who showed great character on and off the court. This along with her work ethic and dedication to the program made it an easy decision to have her join the list of the Laker greats. Green Bay Snares a Wolf: Mackenzie Verbals the Phoenix! Congratulations to Mackenzie Wolf of Kohler, for making an early verbal commitment to the University of Wisconsin – Green Bay! The 6’3″ Laker post player has made great strides in improving her game through the agility and conditioning drills from Laker workouts. Her work ethic has brought her to this point, and we are very proud of her. Congratulations, Mackenzie!